You know how it can be frustrating to deal with a variety of adapters for all of your pedals and music gear? 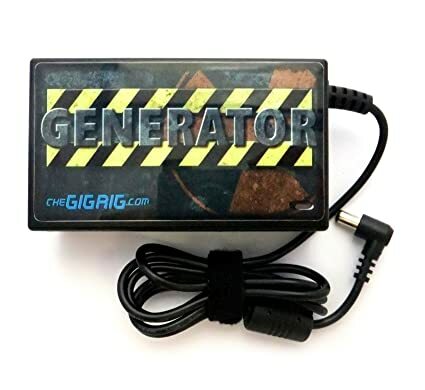 Well, the gigrig generator is a product that aims to make your life much easier by becoming the ultimate adapter. Crafted in the United Kingdom, this device operates as the very heart of the Modular Power Supply system, and can be used to power just about any pedal of piece of musical gear out there. Having your wiring and electricity properly sorted out is just as essential for obtaining a killer tone as good gear or proper cables or any of those minute, yet life-changing details. Therefore, we believe that this fella is more than worth the price tag. So what makes it different to a regular 9V adapter? We are very glad you asked that, kind reader! First of all, this item is outstandingly clean and bright, and offers much, much more sound quality than any regular 9V adapter we have encountered on today’s market. Additionally, it has an astonishing load of 5000 milliamps (5 Amps) of, making Gigrig Generator the most powerful specialist guitar FX supply in the world. Also included in the mix is short circuit protection to take care of the pedals, meaning that experiencing short circuits than can kill your pedal is not even an option. It has a self-healing fuse that significantly increases durability, reliability and longevity. The product is operational anywhere around the globe between 110 and 250V. The Generator comes with a small size, and is very light and subtle despite packing the aforementioned load of power. It was crafted to fit any pedal-board, operating operates on both 50 Hz and 60 Hz mains frequencies. The looks are lean and mean, explosive if you will, and we think it’s cool that the manufacturer took the time to give the product some roaring looks. The design is also highly practical, and the listed dimensions were very carefully though out. The reason why such approach was taken is so that the Gigrig Generator can fit any pedal-board and conveniently be attached onto them while occupying minimal space and not standing out at all. The product comes with a detailed manual on how it can be used and connected to a variety of devices. It takes very little time to get used to it, and once this fella is fully operational, there’s a solid chance you’ll wonder how you ever went without it. That’s what many satisfied customers have said, and we agree. Thus, in a nutshell, this is a high-end item for professionals. This is by far the safest, strongest, most versatile adapter we can think of. It will increase the quality of your sound, it will light up your pedals like a powerhouse and you will never have to worry about the possibility of short circuits or power breakdowns ever again. If you want the best, this is what you’ll want to purchase. Top-notch stuff, a major thumbs up from here!